Oven-baked with love, right here in the USA, our Supreme Source® Grain-Free Gourmet Biscuits are carefully sourced with all-natural ingredients and without any artificial colors or flavors. Our Chicken Meal, Pea, and Carrot recipe is grain-free – that means free from corn, wheat, and soy. A great source of high-quality protein for your dog because it contains more protein than fresh chicken. Carrots provide essential vitamins like Vitamin A and Vitamin C which may help your dog maintain healthy vision and bones. 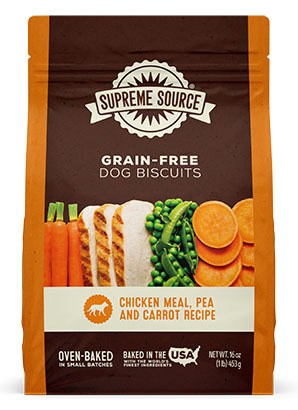 Chicken Meal, Pea & Carrot Recipe Dog Biscuits is rated 4.9 out of 5 by 16. Rated 5 out of 5 by Momarf from Love these biscuits! After trying both the dog and cat food and having our pets love it, I decided to try your dog biscuits. One of our dogs is kind of picky and won't eat a lot of biscuits. Well, when I gave him a Supreme Source biscuit he LOVED it! He never refuses one these biscuits. I will definitely be buying more. Rated 5 out of 5 by Mits07 from My Baby Loves It!! My Min-Pin got allergies last year and i decided to try a Grain Free dry dog food. I looked at all the varieties and what ingredients they had in them, So i chose Supreme Source. Ever since then she hasn't had any skin problems at all! So TY for the best dog food for our furbabie!!! Rated 5 out of 5 by Kelly14 from I finally found one that my dog will eat I bought these dog biscuits to try when I was finding all of the other ones I have bought hidden in my house and my backyard. My dog definitely does not hide these he loves them and wait by the counter for one every time someone walks past it. Rated 5 out of 5 by Lorrie from Very Good for Dogs who have Food Allergies This is one of the very few commercial brand dog treats that my dog can have. She has allergies to Brewer's Yeast and Soy. She tolerates this very well. I do think they are a bet over priced and coupons are difficult to find. Rated 5 out of 5 by Skipper from Both dogs love this food and will eat it dry Bought this food at our local grocery store because my sister's dogs liked it. My two small dogs ate handfuls right out of the bag! They will eat it dry, in their bowls with no added can food. Very impressive! Rated 5 out of 5 by Salsa50 from My dogs love this dog biscuit I bought a bag of the lamb and a bag of the chicken dog biscuits and my dogs just love them I'm glad that they are healthy snack for My Dogs. Rated 5 out of 5 by Chrissy from The best! My dogs had bad skn issues and started them on the chicken they are not only happier and healthier but no more skin problems!!! 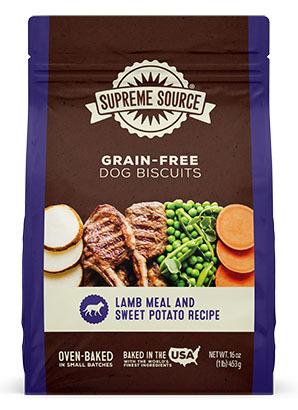 Supreme Source® Grain-Free Chicken Meal, Pea and Carrot Recipe Dog Biscuits are intended for intermittent or supplemental feeding only. Chicken Meal, Sweet Potatoes, Peas, Potatoes, Tapioca Starch, Potato Starch, Poultry Fat (Preserved with Mixed Tocopherols), Carrots, Ground Flaxseed, Natural Flavor, Gelatin, Rosemary Extract. Ascorbic Acid (Vitamin C)* 5.0 mg/kg Min. CALCULATED CALORIE CONTENT (ME): 3,348 kcal/kg., 33 kcal/biscuit.